Are Mini Trampolines Safe to Use for Working Out? Mini Trampolines safety always concerns to them who loves to exercise with a mini trampoline. 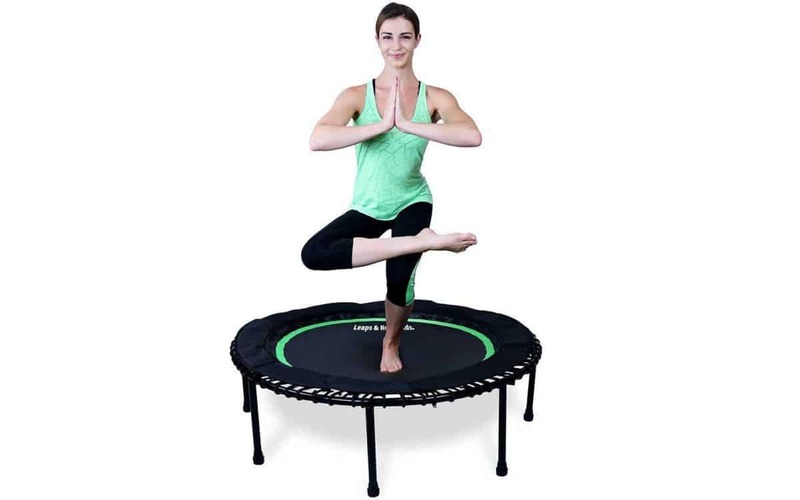 Amateur and professional exercisers alike are always looking for something new to pump up their routines and stay energized, and the mini trampoline–also known as a rebounder–has been flying off shelves. Even, not everyone is convinced that this piece of equipment is safe. With the mat of the trampoline being unstable, it is possible that you could lose your balance and fall, even if you are not jumping. At best, this can result in simple scrapes or bruises, but at worst, you might experience serious blows to the head or even a broken bone. This risk is worst when you take a step or jump that is not directly centered on the mat, which is easy to do if you are trying a new move or start to fatigue. Another possibility when using a rebounder is that your feet can entangle in the springs or bungees. Most good trampolines have a safety covering over these parts, but some do not. The risk of entanglement is greatest on trampolines where the number of springs or bungees is low, as this leaves wider gaps. Although some mini trampolines feature extremely durable construction, many cheaper models are manufactured in such a way that the springs or bungees experience unnecessary wear and tear. If you do not routinely check the condition of the mechanisms, the springs or bungees can snap unexpectedly, which could cause you to tumble. 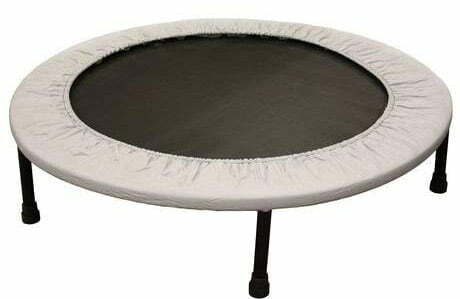 Many companies that manufacture mini trampolines rightly promote them for cardiovascular health, as they can get your heart rate up. Unfortunately, some individuals push too hard when using the equipment, spiking their heart rate into the danger zone. 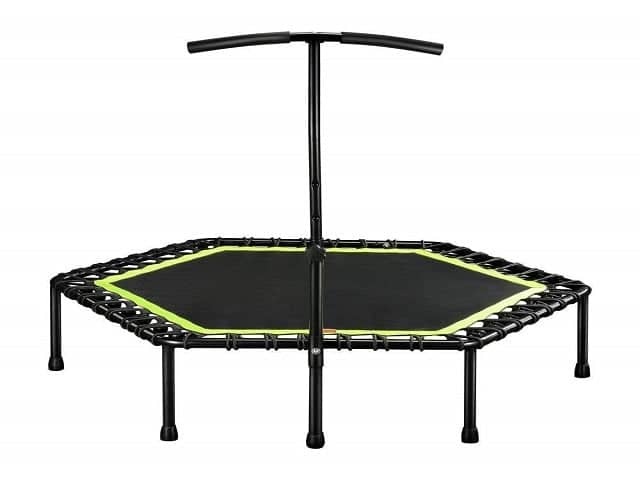 This problem is not exclusive to mini trampolines, but the fact that rebounders are marketed by some companies as “fun” items or even targeted at kids can mask this potential hazard, giving the impression that the rebounder is not in the same class as other serious, adult fitness gear. 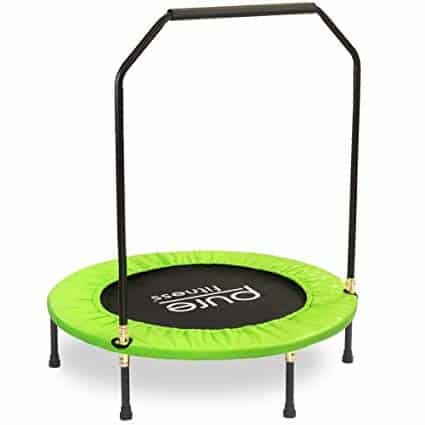 Many of the concerns regarding mini trampolines are based on the assumption that you’ll be using the rebounder for jumping exercises, but this is not the only way you can utilize one. For instance, a very basic exercise is to stand on the mat and simply pedal the feet. You can use them in a fashion similar to stability balls, performing moves such as pushups. They can be handy as a surface for elevating one foot during lunges, as well. Studies also have shown that, even if you get airborne, the amount of force on the joints is only about 15% of what you’d experience on the floor. Some models also have stability bars that can lower the risk of accidental falls. Despite the risks that rebounders have when proper precautions are taken and the equipment is used as directed. They are effective for toning muscle, improving balance, coordination, metabolism and bone density, stimulating the lymph system and assisting with weight loss. These advantages have led some professionals to recommend them even for senior citizens. The safety of a mini trampoline depends not only on the quality of its components but also the specific exercises you choose to use with it. Serious injuries can and do occur with one, so under no circumstances should you treat yours as a toy. Simple precautions such as placing a safety mat underneath the rebounder, choosing a model that has a slightly larger diameter. Getting a medical evaluation prior to exercise that can help you select moves and intensity levels, limiting the number of people on the trampoline at once, exercising when you are well rested and attentive, and leaving yourself plenty of space around your exercise area all can reduce the danger of getting hurt. Used properly, a mini trampoline or rebounder trampoline can provide a unique and challenging workout. This type of jumping workout can be a particularly helpful option if you have joint problems that prevent you from performing a more traditional workout. For example, using a mini trampoline may be beneficial during preparation for or recovery from knee replacement surgery. 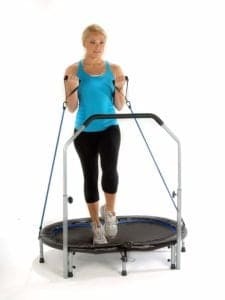 Regardless of your exact situation, you should follow the guidelines of your doctor or therapist regarding rebounder trampoline workout specifics. Is Running and Jogging Knee Friendly? Running and jogging tend to be very hard on your joints. The vibration that occurs as your feet hit the ground can send shock waves of pain into your knees; this is often very problematic if you have knee problems or recently had knee replacement surgery. Working out on a mini trampoline, then, can be a much better option for both adults and kids as well. Safe and effective, it provides a low-impact workout that is often far less harmful to your knees. People who are overweight are at an elevated risk of developing knee problems. They often find weight loss difficult, especially when living with chronic, severe knee pain. 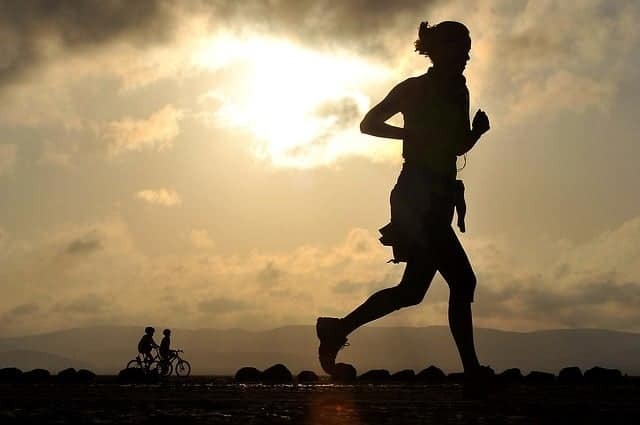 Normal exercise techniques for weight loss, such as jogging, may be out of the question if the knee pain is severe. Working out on a trampoline, however, means the mesh and springs will absorb much of the shock of impact, saving your knees and sparing you pain. The instability of the surface, though, means that even simple motions can make you work up a sweat. The result is a challenging cardio workout that should not cause further damage or pain to your knees. Unlike many other exercises that require significant bending of the knees, trampoline exercises allow you to get a workout without constant knee movement. You can keep your legs straight or you can bend them slightly; but trampoline workouts do not necessarily require you to bend your knees sharply. This allows you to grow stronger and more flexible without forcing your knees into uncomfortable or risky positions. Trampolines may call to mind visions of high bouncing and the potential for an upset stomach, but mini trampolines are actually far more versatile than that. You can walk in place on the rebounder, allowing you to safely get your blood pumping without stressing your joints. Additionally, you can simultaneously carry a dumbbell in each hand to add an upper body workout. You can also add a core workout simply by twisting your torso from side to side as you gently walk on the rebounder trampoline. Of course, if you have knee problems, you should follow the advice of your doctor or physical therapist regarding what type and intensity of trampoline workout you can safely handle.